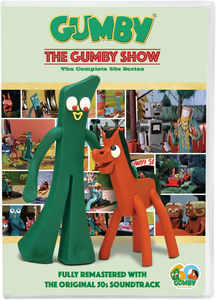 Discussions Magazine Music Blog: GUMBY:The Complete '50s Series reviewed by Spaz! 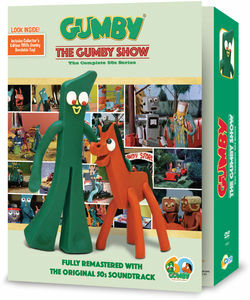 GUMBY:The Complete '50s Series reviewed by Spaz! If you are lucky, you have fond memories of the ‘good old days’ when you were a kid – playing outside with your friends or spending good quality time parked in front of the TV set watching all of your favorite shows. No matter what decade you were born in, you’ve got personal favorite shows that take you back to those simpler, more innocent days. For many of us, Gumby was a huge part of our childhoods. It was – and still is - one of the most imaginative and surreal shows ever created for kids. The concept of stop- motion animation dates back to the dawn of motion pictures but nothing stirred the imagination quite like Gumby. It was absolutely mind-boggling and completely ahead of its time. While CGI and modern animation may seem to ‘look’ better, it lacks the depth, soul and emotion of Gumby. Going back and viewing all 20+ episodes in this set, I am also reminded just how important ‘color’ and ‘sound’ were to the world of Gumby. 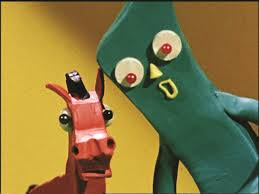 As a kid born with vision and hearing impairments, Gumby was a show I could connect with. Re-watching these episodes now, I remember every sound effect, voice inflection and even the visual look of Gumby’s world (right down to the cornfield rows in one episode or the look on the face of an angry musical note in another). And the episodes are all just as magical today as they were back in when I first experienced them in the '60s. These Gumby episodes explored a completely unique world where different characters were defined by color, shape and personality. Just watch this set and you'll discover the true inspiration behind the look and feel of the immensely popular The Nightmare Before Christmas. Now celebrating his 60th Anniversary, Gumby returns on DVD in this special two DVD set that features all of the original uncut 1950s episodes in their entirety. Not only are the episodes remastered from the original film reels, they contain the original soundtracks complete with original voices, sound effects and music (in the ‘80s, they ‘updated’ the soundtracks in order to appeal to a new generation of kids). Believe it or not, this is the first time you’ll be able to watch a complete original episode in 55 years! And they’ve never looked or sounded better. With bonus features including “Gumbasia”, the stop-motion short that Art Clokey created that led to the birth of Gumby (you can read about that in my interview with Joe Clokey HERE), this is a DVD set worth your money and 200+ minutes of your time!